In one of the birthplaces of Christianity, worshippers continue to practice their religion side-by-side with their Muslim "brothers". High above the modern Turkish city of Antakya (Antioch) lays a relic of a former age. The Church of St Peter, now a pilgrimage site with a clear trail marking the way, was once a hidden centre of early Christian worship. Composed of just a one-room cave about 13 meters wide, this sanctuary was crucial to developments in the history of Near Eastern Christianity, and is old enough to be mentioned in the Bible itself. It is here, according to legend, that followers of the newly emerging religion first called themselves Christians. Though the church now serves as a heritage site and museum operated by the Turkish state, a hike down the mountain and into the city below leads visitors to a number of churches that have active congregations and daily services. Official studies of the population of Turkey estimate the number of non-Muslim citizens to be less than .02%. In this corner of the country, however, the religious and ethnic diversity is much higher and, significantly, religious conflict nearly absent. "There are no problems here," the head priest of the Catholic Church of Antioch, Domineco Bertogli, explains. "We live openly, we worship openly." Indeed, the Italian priest's church is located next-door to a large mosque, and prominent plaques point the way. Adalet, a young woman who works in the church with Bertogli, grew up in Antakya and takes pride in the city's level of tolerance and multiculturalism. She points to a poster hanging on a bulletin board that also displays church announcements and service hours. "Do you see that?" Adalet asks, smiling. "Antakya was chosen as one of UNESCO's cities of peace." Also on display are pictures of Bertogli shaking hands with President Abdullah Gul and standing next to the Pope. Sent to Turkey initially in 1966, Bertogli spent years working in a church in Izmir before coming to Antakya. Over the course of the 45 years Bertogli has worked here, the priest has assimilated, learning the language fluently and, he says, being happy to serve the church. 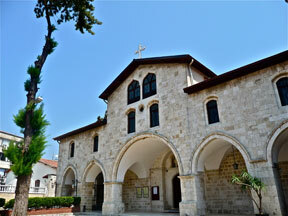 The Catholic community of Antakya is not the largest Christian population in the region. Many more Orthodox Christians, whose traditions separated from those of Catholic Rome during centuries of Byzantine rule, live and worship here. The Orthodox Church of Antakya underscores the presence of this community, with its elaborate iron gates and large courtyard open to the public. Antakya is the largest city in the province of Hatay, and, like many urban areas, has developed as a centre of diversity. Farther away from the city, however, active Christian communities still prosper. Near the Syrian border in the Altinozu district, two almost exclusively Christian villages remain, Sarilar and Tokacli. Villagers are nearly all Orthodox, with perhaps a handful of Catholic families. Emin Mizikacioglu, an Orthodox Christian who runs a small market in Sarilar, expresses a mixture of tolerance and pride regarding religious differences. "We live together like brothers, all of us," he says, then breaking off his sentence to tease the Muslim bus driver about how slowly the vehicle is moving. A few minutes later, when Sarilar becomes visible over a ridge in the hilly landscape, he softens his voice and says with some excitement, "This is my village. You won't find a single Muslim family here. Not even one." This dual perspective -- that Muslims and Christians and Jews are all siblings, but that a Christian village is still something to be treasured -- may be part of what enables these varied communities to maintain their own identities while engaging peacefully and productively with other groups. Bertogli, perhaps drawing on his experiences while working elsewhere in Turkey, emphasises that while Antakya and its environs may truly be cities of peace, they are not necessarily indicative of the situation elsewhere. "There isn't just one Turkey," he says. "There are many Turkeys."